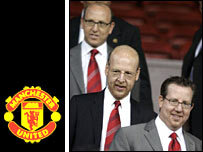 The Glazer family have denied reports that they are to sell Manchester United to overseas investors. Rival investment groups from China and Dubai were reported to be preparing £1bn takeover bids for the Premier League champions. But a spokesman for the family said: "Manchester United is not for sale. "The Glazer family are not engaged in any discussion with any prospective bidder and it is not courting bidders for Manchester United." The Glazers paid £790m for United over two years ago to complete a takeover that was initially controversial with a section of the club's fans. What do you make of the speculation surrounding Man Utd? But the Glazers appear to have won over some of the United support by backing Sir Alex Ferguson strongly in the transfer market since taking control. It is understood that an unnamed Chinese consortium approached the club - rather than the Glazer family - months ago to see if the Glazers would be interested in selling United and were told the club was not for sale. Earlier this year reports suggested that the American billionaire owner Malcolm Glazer was ready to sell United after profits fell short of his expectations. But the family insisted that they were "committed to the long-term ownership of the club".